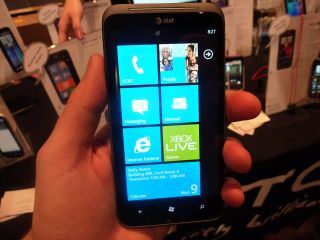 HTC has announced the massive Titan II Windows Phone at CES. Suffice it to say, Nokia's Lumia 900 is going to have some competition for best Windows Phone when they launch. The big news here is Titan II's 16 megapixel camera, which is easily twice as many as most competing phones, and a 25% more than Sony's recently announced super phone, the Xperia S.
Obviously the myth of more megapixels equalling better pictures has been well debunked at this point, but the detail in the pictures the HTC took was truly astronomical and it's not hard to imagine 16 megapixel becoming a new standard in handsets. This is due in no small part to its backside-illuminated sensor, but other camera features show just how seriously HTC is about this phone's camera. It has image stabilization, a variety of focus modes, 720P video recording, and a dedicated camera button. While the camera is the major selling point, there are a few other areas in which the Titan II diverges from its predecessor. The Titan I had a removable battery, this one does not. But as the battery bumps from 1600mAh to 1730mAh, we'll take the trade. We do have to wonder if AT&T's LTE and enormous screen will eat through that battery quickly, though. In the hand, the HTC Titan feels like, well, other HTC phones - specifically the Thunderbolt which it resembles as much or more than the Titan I. There's no kickstand and the smooth back feels great. The camera forms a little bulge on the back, but it doesn't feel extreme. The HTC Titan is similarly specced with other Windows Phones: it uses a 1.5GHz Snapdragon processor, 512MB of RAM, and 16GBs of non-expandable storage. Continuing the Titan's legacy of having the largest Windows Phone display, the Titan II keeps the 4.7-in WVGA super LCD capacitive touchscreen in tact. The screen looks huge and gorgeous, and - though all Windows Phones are limited to 800 x 480 resolution - we found Windows Phone 7.5 Mango looked perfectly crisp. The HTC Titan II release date is still yet to be determined. Like the Lumia 900, announced on the same day, the Titan II will be on AT&T LTE's network and both will sport Mango, so we expect them to be quite competitive. Which do you prefer?